What Was Your Experience Learning to Drive a Car? One of my favorite shows, AP Bio, is back. 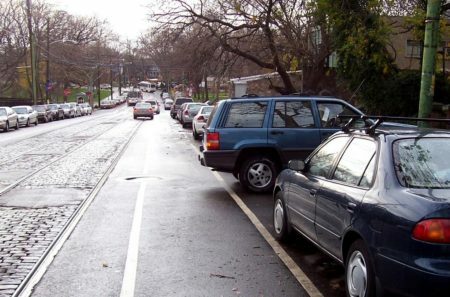 The latest episode heavily featured driver’s education–including an amazing parallel parking job–and it reminded me of those days when I was learning to drive. In Virginia, we were allowed to get a learner’s permit when we turned 15, allowing us to drive with a licensed adult in the car, followed by the real license at 16. However, I had no interest in getting a license; rather, I enjoyed being chauffeured to school and soccer by my parents. Eventually, my parents got tired of this, so well after I turned 16 they made me get my learner’s permit. I enrolled in a driver’s education class in school, followed by a series of private lessons/tests with (I think that’s a Virginia thing). I was fairly terrified of the idea of driving at full speed along roads where cars driving even faster in the opposite direction were separated merely by a painted yellow line (the thought still occurs to me sometimes when I’m driving). I also wanted to make sure I followed all of the rules by the book, even though I didn’t always understand the practical applications (and I simply misunderstood some of them). For example, one of the books said that when you pull to a stop behind another car, you should be able to see where the tires of that car touch the road. I interpreted this to mean that you should only stop when you can only see a little bit of the tire remaining, resulting in me slowly easing to a stop so close to a pickup truck that the front bumper was under the trailer. In the end, though, I passed my written exam and road test, and the rest is history. While I still don’t get a thrill out of driving, and I look forward to autonomous cars, I’m often the chauffeur among my friends in my glorious 2003 Camry XLE. Unlike the kid in AP Bio, I’m pretty good at parallel parking (better, in fact, than regular parking). What was your experience learning to drive? Would you consider yourself a good driver now as a result? This entry was posted on Sunday, March 17th, 2019 at 9:15 pm	and is filed under personal and tagged with personal. You can follow any responses to this entry through the RSS 2.0 feed. My first experience driving was in our high school’s summer drivers ed course. My parents didn’t take me out before my first lesson, and thus it was my first time behind the wheel. I hit a curb too hard and blew the tire because I hadn’t figured out turning. The car was out of commission for a couple weeks while they got a new tire and my teacher made sure everyone in the course knew why it wasn’t available. They had several other cars luckily. He told me before my final test in the course I would fail my driver’s test. I passed the actual test on my first try, and have no accidents except getting hit by a drunk cop. I consider myself a pretty good driver, despite the rough start 😂 No one I know is afraid to drive with me. Wow, that is a truly rough start! Was the cop in his/her police car while drunk? No, he was in a personal car. He tried to tell me he was a cop when he hit me, so no one else would need to come to the scene, and then called the wrong police department to ensure that no one would come out. Promptly sped off and left me on the side of the road with a totaled car. It was a fun couple months of legal battles after that. Luckily I wasn’t hurt, so it could have been worse. If I was smarter at the time I would have called the police on my own before he left, but I was in shock and still pretty young. What?! Wow. I wouldn’t know what to do in that situation either. I’m glad you weren’t hurt.